Each year Katherine and I (and whatever grown children can join us) make our way to New Smyrna Beach, Florida. 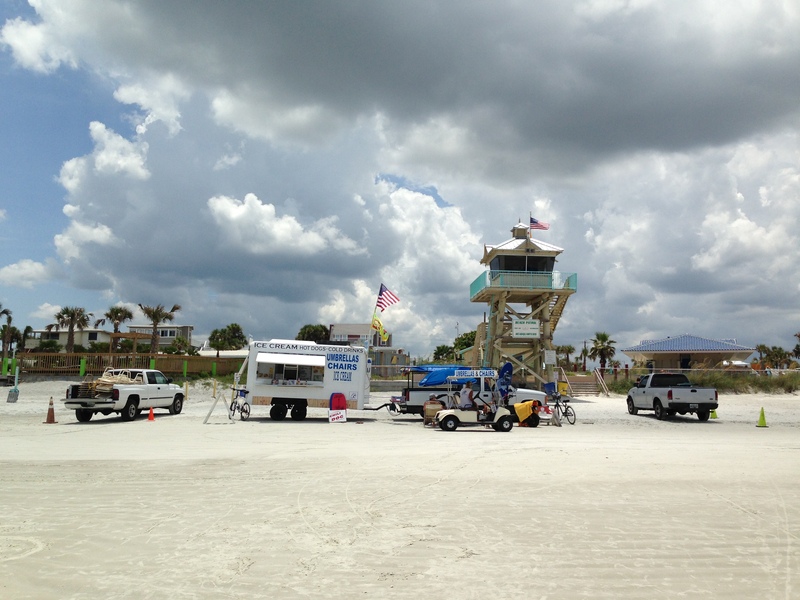 It is our hideaway, an unspoiled shoreline between Daytona and Cocoa, two tourist-clogged beaches. We have been coming this way for 13 or so years, all the way back to when our children were, well… children. The beach shop on wheels pictured above is where we rented our chairs. They dot the beach down the shoreline, not offensively, but in a way that they seem to belong there. They rent chairs, boards and floats, and they sell towels, hot dogs, lemonade, ice cream, soft drinks, candy and boiled peanuts (a personal favorite) – you name it. While engaging with the man who owned this particular shop (no one is safe) I learned that his grandmother makes the ice cream he sells – how cool. He is roughly 40 years old and is a third-generation New Smyrna Beach native. You don’t meet many. It occurred to me that the Christian Faith is a little like that beach shop on wheels, and its owner, with his ice-cream making grandmother. It is like a family that has been around for a while – a long while, with its crazy uncles, strange family quirks, dark moments and endearing traditions. Suffice it to say that it isn’t new. We in ministry sometimes spend too much energy attempting to dress it in groovy new threads, but at the end of the day, it is something that has been handed down, just as it was for Timothy. It isn’t handed down in the, ‘If it was good enough for your father it should be good enough for you!’ kind of way. It is more like a story that emanates from the voice of God in the scriptures, and one that is recited in creeds and confessions, conversions and church communities, retelling itself over and over again through generations, in the lives of people. It isn’t new and yet mysteriously, it isn’t static either. It is a story that never changes, but one that continues to unfold – one we enter into through faith, only to discover that our place in the narrative was written for us and others long ago. Here is the thing: Every one of us needs something greater, larger and more enduring than we are. We need a greater reality than the daily struggles and complexities of life because we so easily become consumed with fear, doubt, self and unbelief when we become lost in the uncertainty of any finite moment. And the gospel, this hand-me-down religion, teaches that someone else has suffered before you. Someone else has despaired. Someone else has been filled with sorrow. Someone else has experienced fear. And someone else has endured. Men, women, girls and boys have lived in other eras and have experienced faith and unbelief just as you have. You aren’t the first and won’t be the last. You aren’t alone. Jesus has been there too. And His experience is what makes sense of, and brings hope to, everyone else’s entanglements, because when Jesus made His entrance into the world it was to weave us into His big story. Not only has He suffered, despaired, experienced fear and faced sin, shame and sorrow – but He has overcome. And His triumph ensures that while you imperfectly struggle to make it in this often heartbreaking, fallen world, with all its disappointments and snares, you will discover time and again, that in spite of your imperfect attempts to keep the Faith… it is the Faith, this beautiful hand-me-down religion, that is keeping you. You are currently reading Hand-Me-Down Religion at unfinished1.